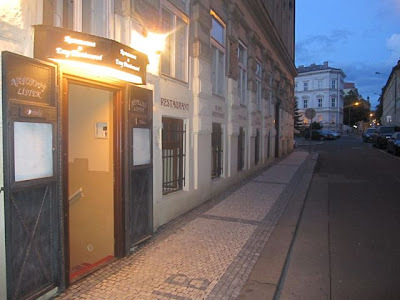 When I first visited Restaurant U Emy Destinnové almost three years ago, I liked it, but I wouldn't call it love. 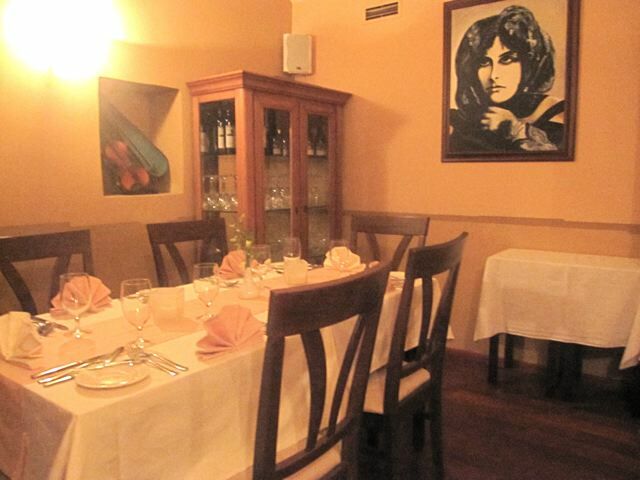 The restaurant is in the building where the opera soprano, Emmy Destinn, was born. It is hidden away at the end of a side street near I.P. Pavlova metro station. Perhaps it was a case of "out of sight, out of mind," but I didn't go back for a repeat performance. I was looking for a place to take a visiting Bavarian journalist. One look at U Emy Destinnové's online menu had me convinced. It's a good read. I saw at least six dishes I wanted to try based on their descriptions alone. Perhaps the menu spoke to my inner food soul because the restaurant has an American chef, Steven Trumpfheller. We speak the same language, it seems. The restaurant's interior was updated since my previous visit. The room has some atmosphere, with antique furniture pieces and piano that is played on some nights. 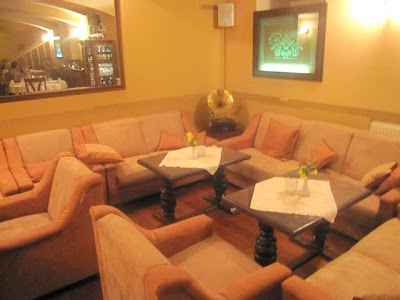 But I didn't love the coral couches and what looked, in low light, like a beige-pink color scheme for the walls. Music, when not live, is rather eclectic. It tends toward Muzak versions of Lionel Ritchie and mellow electronica. There was one waiter, and since he was busy with another table, Chef Steven came over and took our drink orders. We received some crusty, warm rolls in a basket along with butter. Be aware that there is a 25 CZK per person cover charge. I started with a beer. 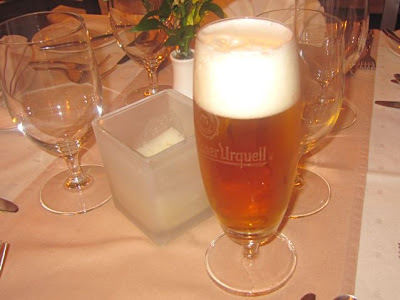 They only have .3 liter glasses of Pilsner Urquell (45 CZK). It was as it should be. 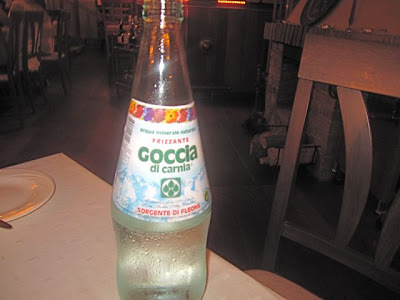 We also had a .7 liter bottle of Italian sparkling water (150 CZK). The water was fine, but I would have preferred something cheaper, like Mattoni. 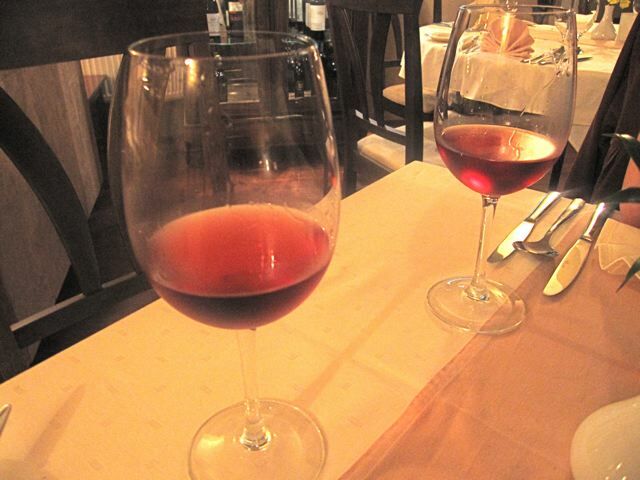 Chef Steven told us he had gotten some very good Portuguese wines, so we ordered a bottle of Defese rosé (650 CZK). We both thought it was excellent -- nicely chilled, not too sweet, and with just a slight tart note. 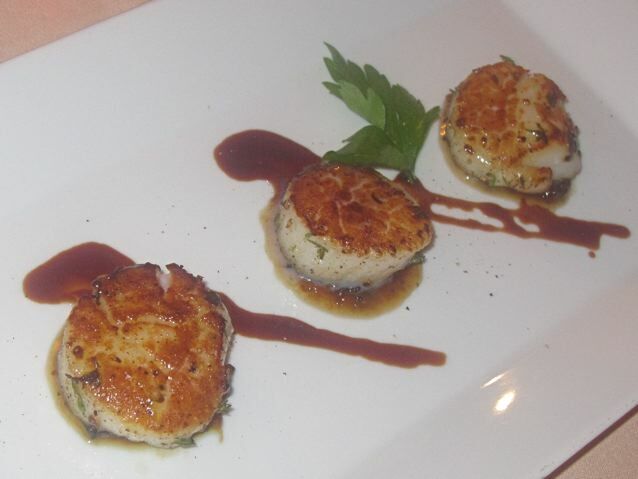 Chef Steven, who spends lots of time in the dining room, recommended his imported American scallops, so the Bavarian ordered those (275 CZK). She was so glad she got this special. They were fantastic. I've never seen larger scallops in this country. They were fresh and perfectly seared, with a light, brown crust on the top and bottom. The interior was shimmering and delicate. The three of them sat atop a fig marmalade that rightly countered the light saltiness of the scallops. And my pleasure with this base was increased by a pleasant, spicy zing. Yum. I ordered the seared Argentinian steak salad with mixed greens, onions, cucumbers, peppers and tomatoes. 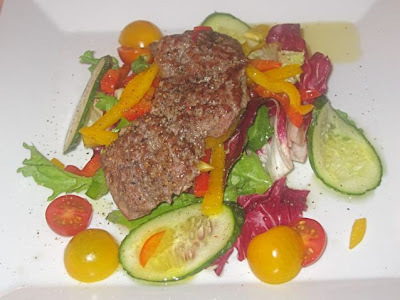 It was advertised as being dressed with a lemon-lime chipotle honey vinaigrette. This dish was the only real disappointment from two visits. 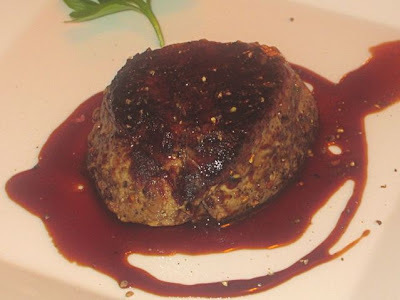 The steak had good flavor, but it was not tender. The salad underneath was not terribly exciting. But my biggest issue was with the dressing. It sounded great, and that was one of the main reasons I ordered the salad. But it tasted mostly like oil and had almost no flavor. On one of Chef Steven's visits, I told him what I thought. He said that the dressing used to be more assertive, but he had to tone it down to adjust for Czech tastes. Whatever the reason, this version went to far the wrong way. For a main course, the Bavarian had black risotto with grilled octopus and calamari (215 czk). 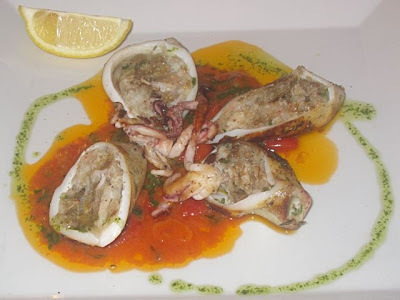 The calamari was sliced into very thin rings and it was incredibly tender. The risotto was properly al dente, and provided a creamy foundation of flavor. I didn't see so much octopus and wished for more. I ordered the stuffed calamari with shrimp, crab and mushrooms over a tomato-butter reduction (290 CZK). This was a small, but decadent dish. I didn't detect so much, shrimp, crab, or mushroom flavor. But still, it was a blissfully buttery stuffing. 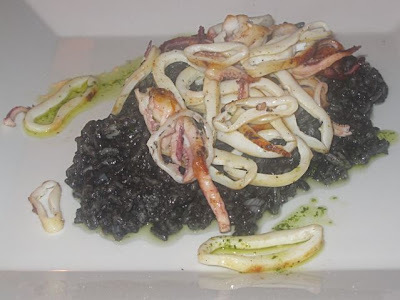 The calamari was fresh, but tougher than than the slices served with the risotto. The reduction was delicious. It had the perfect acidic intensity to cut through all that butter. It wasn't a lot of food, but I did enjoy each small bite. Then came dessert. I asked for the chocolate seduction rum cake (120 CZK). It was silky and rich, with only the mildest hint of rum. I really enjoyed it, but the beautifully patterned icing on top looked too perfect. I asked the waiter if it was made in-house, and he insisted it was. 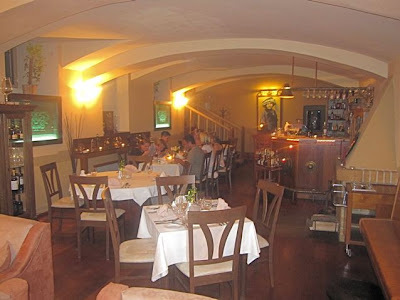 The bill for this meal, which included a good bottle of wine and a Bailey's (80 CZK), came to 2005 CZK without tip. We were both very satisfied and thought it was a fair price for the quality. 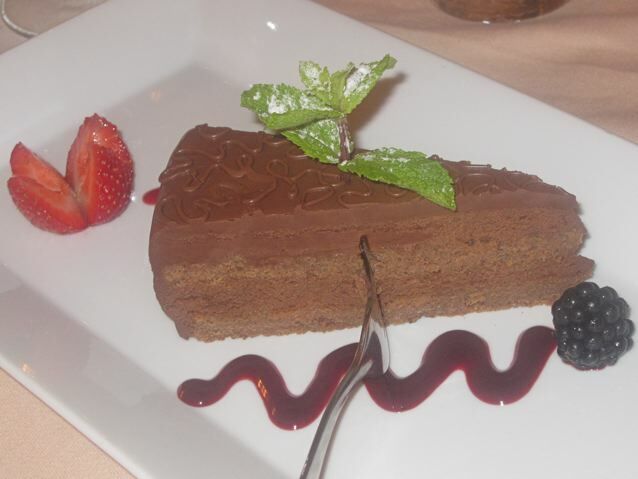 There were many more dishes I wanted to try, so I returned alone and dined in the back room the following week. Chef Steven saw me come in and came by to say hello. He said he'd heard about me questioning the provenance of the desserts, and told me they had a lady coming in a few times a week to make them. He also remembered and recited every dish we had on the previous visit and where my guest was from. Good memory on that guy (he also knows way more about baseball than me). If you think I received some sort of special attention, know this: Chef Steven spends a lot of time conversing with every table. If you visit this restaurant, you'll likely get to know the master of this kitchen quite well. In another life, he should run for office. His Czech partner, the equally friendly and efficient, Jiří Pešek, acted as my waiter on this second visit. 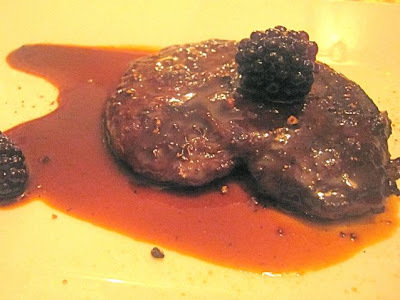 This time I started out with the wild French duck breast with a blackberry port wine demi-glace (175 CZK). While duck breast is often served rare, this one was cooked through. 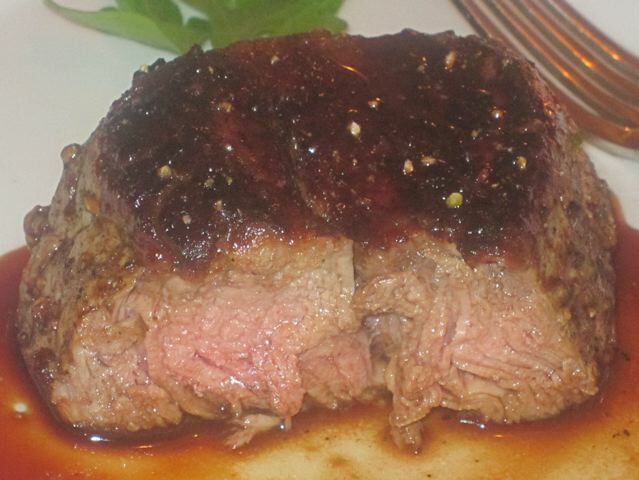 All too often, when cooked like this, the meat becomes dry. Not in this case. Firm and lean, it was a peppery, juicy little duck steak. The demi-glace complemented the flavor of the game. I sparingly used bits of the fresh blackberry on the plate with each bite. Very nice. For my main course, I had to try the grilled Argentinian beef tenderloin with a Chianti reduction (330 CZK). I thought it was exceptionally good. The exterior had a scrumptious, peppery char. The interior was tender and hit the right beefy flavor points. The only failure here was that I asked for it to be cooked medium-rare, and I'd call what I received at least medium. The Chianti reduction was sublime. I only thought it needed a dash of salt. That brought perfect balance to the sweet notes of its balsamic and honey elements and the assertiveness of the wine. 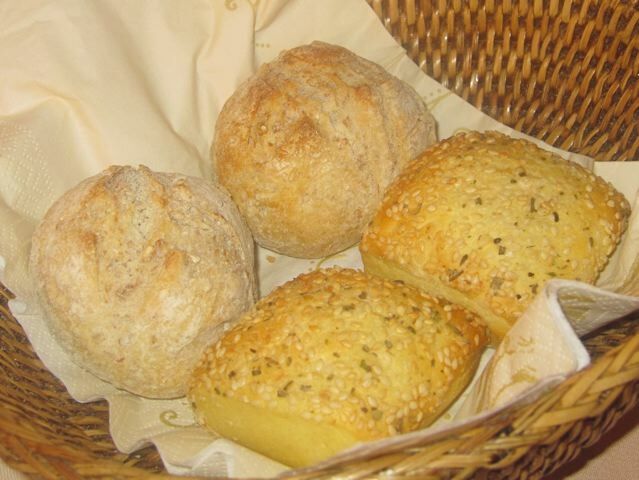 Confession: I ran out of bread and, since I was alone in the back room, I licked the plate. 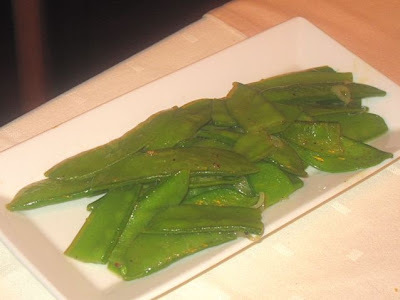 On the side, I had wonderful snow peas with roasted shallots (60 CZK). With a meal this heavy, I wasn't in the mood for potatoes. I thought it was a great partner for the steak. 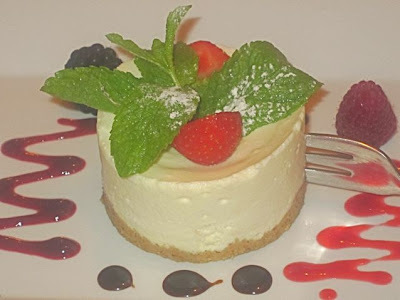 Finally, I had to try their real Philadelphia cheese cake (105 CZK). I was expecting a classic American slice, but this was something a little different. This individual, lemon-zesty cake was far creamier than what you might find at Cheesecake Factory. Chef Steven told me he whips it to get it that way, and that he also imported boxes of graham crackers to get the crust just right. With a couple of beers, the bill for this three-course trip was 785 CZK without tip. Eminently worth it. On two visits, I enjoyed every dish but one. The dining room feels more like a living room with a dinner party going on, and you're almost definitely going to have a conversation with the host. And the host told me that he plans changes to the menu soon. I do hope he holds over some dishes, but whatever he turns out, Chef Steven does know how to make food sing. What stands out in my mind about his cooking is that he's a master of sauces. I really hope he keeps cooking the one with the Chianti. I'll be back for that, for sure. I was just wondering if the Chef also knows Czech / speaks with Czech guests. I love conversing with the management or the chefs / waiters, but now that I read your review I would probably feel like I was short-handed by the restaurant if nobody came to my table to ask about the food or recommend something special. Do you have any idea if they do? I believe he does speak Czech (though I can't say for sure how well). Also, his Czech partner Jiri is usually there and is equally friendly with guests.